Heart disease is the number one cause of death in the U.S. making cardiovascular health a top health priority. Keeping your heart healthy means maintaining healthy cholesterol levels, reducing inflammation, and ensuring healthy circulation and blood pressure. Proper nutrition is vital to all these steps towards a healthy heart. 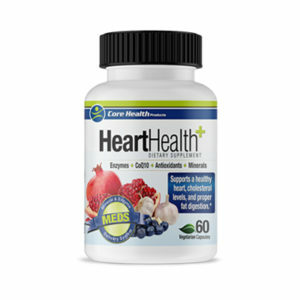 Core Health Product’s Heart Health is a superior product combining powerful heart-healthy ingredients like garlic and bilberry with effective levels of CoQ10, chromium, magnesium, and pomegranate in a unique proprietary blend. Garlic, bilberry, and pomegranate are all natural foods with a history of use promoting heart health, and modern clinical studies have now demonstrated their potential to reduce cholesterol, improve circulation, and lower blood pressure. These natural antioxidants are combined with nutrients such as CoQ10, niacin, magnesium, and chromium that are essential to promoting healthy circulation, healthy blood pressure, and healthy blood lipids. Core Health Product’s Heart Health formula further differentiates itself by including a distinctive blend of lipases to ensure maximum lipase activity. Lipase is the enzyme required to break down fats. Including lipase in this unique formula helps ensure the body is able to better utilize fats; both consumed and stored. Every Core Health Product includes our proprietary nutrient delivery system, known as M.E.D.S.™. This proprietary system uses the power of enzymes and fully-utilizable micronutrients to delivery maximum results. The exceptional combination of ingredients in Core Health Product’s Heart Health formula helps maintain a strong and healthy cardiovascular system, healthy blood pressure, and healthy blood lipid levels.